20X magnification of the somatosensory cortex of a mouse brain slice. 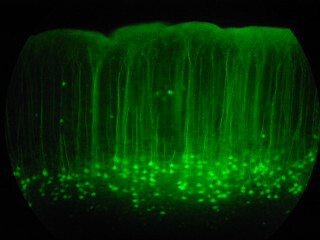 These little guys have green flourescent protein (GFP) from a jelly-fish expressed in a subset of their neurons. Layer V neuron cell bodies are the teardrop shaped things at the bottom and then the dendrite reaches up like a tree to then bifurcate near the top (pial surface).